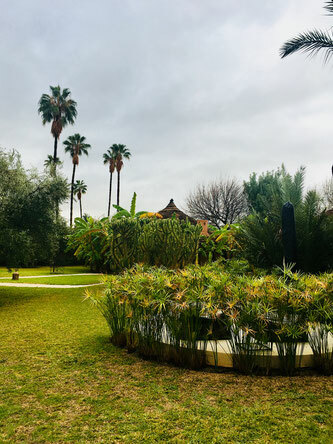 We started our trip in Marrakesh and were overwhelmed and in love at first sight. It's the perfect place to get lost strolling over the markets (we didn't buy a single carpet though), to eat all the food and to take a break at the hammam. We started our trip at AnaYela and loved everything about it. Les bains de l'alhambra: It's pretty fancy, but if you are travelling in a boy/girl combination, you'll have to go to a private hammam. Totally worth it though. Next time I'd love to try a more traditional hammam, but I'd have to go with a girlfriend or by myself. Le jardin. 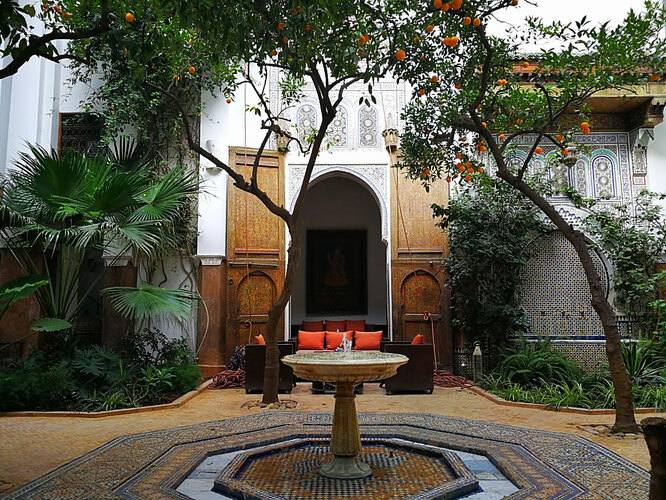 It's a designer's dream come true, a Riad made of the most beautiful tiles, filled with candles. We then took a train to Casablanca, which is a lot nicer than it's reputation. 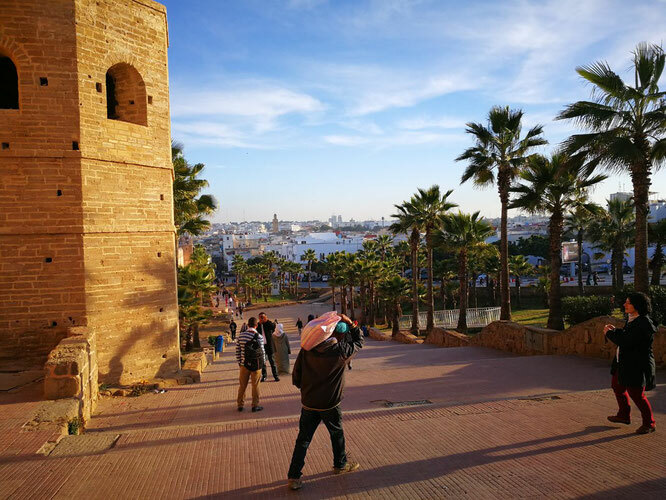 While the architecture in Marrakesh was mainly built by the Berbers (look out for pisé, a mud brick used for all kinds of buildings), you can see the Andalusian influence at the coast. Everything feels a bit more modern, which also includes great new restaurants and bars. 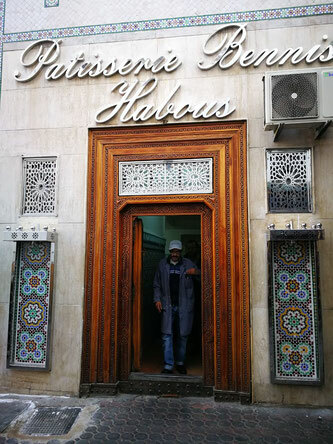 Habous. This quarter was built in the 1920's to make space for more workers, therefore it's called “the new Medina”. It's quieter than the old town and great for a stroll with many shops in small alleys. 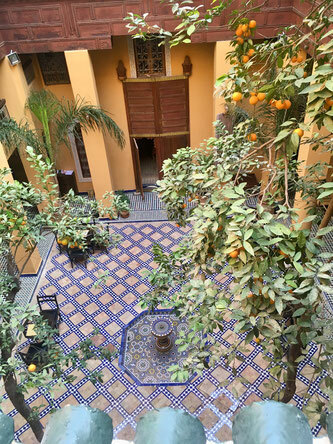 we stayed at Hotel Central, which is located right at the border of the old Medina. 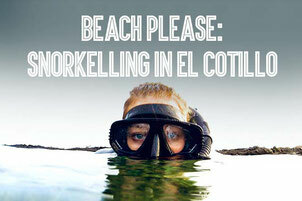 It's a great place, if you're on a budget and would still like to be in the old town. As it's at the border, you can even drive there (many streets in the Medinas are too small for cars). Fes feels like a compressed version of Marrakesh. The streets are even smaller and there are shops and market stalls everywhere. 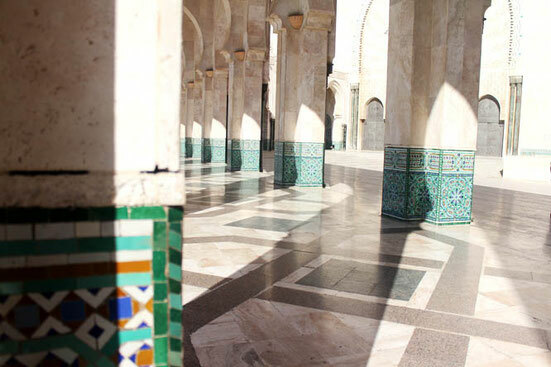 If you have a choice, you might want to start in Fes instead of Marrakesh, as it's less overwhelming. Medina social club: I still can't believe, that this is actually a hostel, because we kind of ended up in a suite. They have a little café, a massive roof terrace and cultural events every now and then. My favourite kind of hostel. Yes, we went twice, because it's so good. 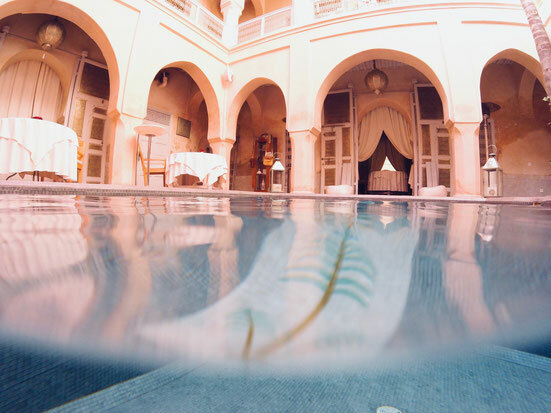 The hammam is part of Riad Laaroussa, a beautiful hotel right in the Medina. We only stayed here, because it was half way back to Marrakesh. And we loved it! It has the same Andalusian style as Casablanca, but in a less stressful surrounding. 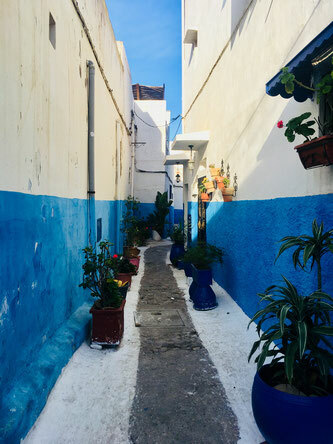 Rabat has a blue Medina, which is a must see (if you're not going to Chefchouen). 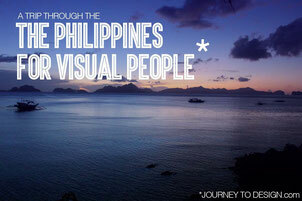 It's also located right at the beach, which is worth a look, too. Since we flew out of Marrakesh, we decided to spend our last few days here. 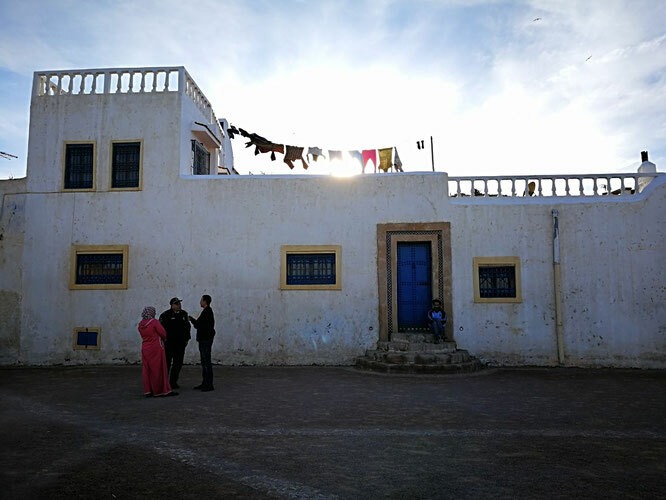 This time we stayed outside of the Medina for some more peace and quiet. Les 5 Djellabas has a massive garden with only ten little lodges. For us, it was the perfect quiet ending to an exciting trip. 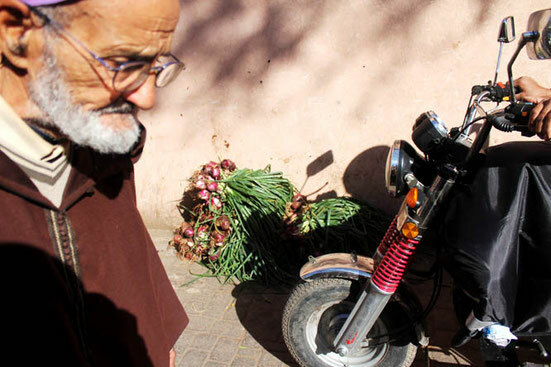 We met Mustapha looking for a cab at the train station and ended up calling him whenever we wanted to go anywhere in Marrakesh. Since we only had ten days and went in winter, we opted for these four cities. Next time, I really want to go to Chefchaouen to see the blue Medina, to the desert to ride camels and to Essaouria for some beach time. How much is travelling in Morocco? 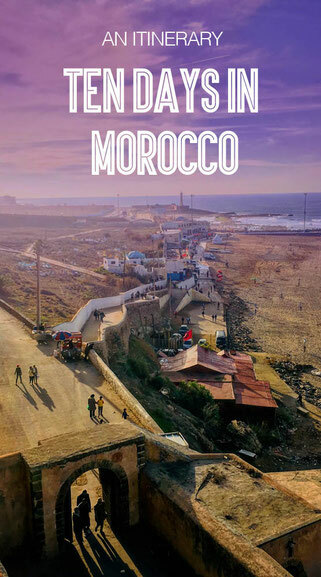 Morocco is a great place if you're on a budget. You can get a sandwich and fries for 1€ everywhere and hostels for about 10€ a night. A nice dinner for two will be around 40€. If you buy anything on the market, just make sure to haggle. We took the train, as there is a direct connection between the places we wanted to see. Tickets are around 10€ (for a four hour drive) and the trains are just fine. We only booked second class tickets and bought them right at the station. The only difference to first class is that there are 8 people in one compartment instead of 6. But the trains were empty and we had a compartment to ourselves most of the time. Check the oncf website for departure times. Don't worry, most people speak English. If you know a little French, they will be super happy and it helps with haggling, but you'll get around without it. Nobody will expect you to speak Arabic. An annoying scam, that's unfortunately very popular is to guide tourists in the wrong direction, so they end up being lost. Then someone will show up, offering you help (for money). Just don't believe when someone (usually teenage boys) sends you one way without you asking for help and double check on your phone. When we did ask for directions, everybody was super friendly and helped us out. I didn't end up in a situation I felt uncomfortable with a single time. We got lost a lot, so I was happy J was there, but would have felt just as safe with a female friend. Ending up in dark dead ends again and again is scary and annoying everywhere, so try to go with someone you can laugh about this with. If you're worried about the dress code, have a look here. 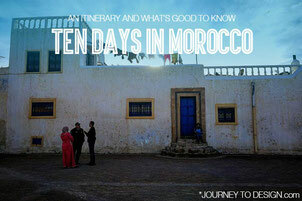 I hope you guys found my collection of ideas what to do in Morocco helpful. Have you been? What were your highlights? Let us know in the comments!